Over the next two days, Minnesota regulators will hear Enbridge Energy's proposal to replace its deteriorating Line 3 pipeline. The Line 3 oil pipeline was installed in 1967 and runs 1,097 miles from Edmonton, Alberta to Enbridge’s Superior Terminal. According to past WPR reporting, corrosion on the outside of the pipeline due to a coating used at the time of installation has led to the need for replacement. With the hearings underway, Minnesota Public Radio provides an explanation as to why the decision matters. Enbridge Energy, based in Calgary, Alberta, wants to build an oil pipeline running southeast from Canada's tar sands region to Lake Superior's western tip near the Minnesota-Wisconsin border. The pipeline would replace Enbridge's current Line 3, but along a different route. Enbridge says its current Line 3 pipeline, built in the 1960s, needs to be replaced because it's corroded and cracked, which means it can't carry as much oil as it once could. It also means the line can't carry heavier grades of crude oil that comes out of the oil sands region. The company wants to build along a new route so it can continue operating the existing Line 3 during construction of the new pipeline. The new route would also move the pipeline off tribal land. Line 3 timeline: From construction to present-day battles. Regulators along the route have signed off on the plan — except in Minnesota. Now, a yearslong debate is coming to a head as Minnesota officials choose whether to give the pipeline their blessing. 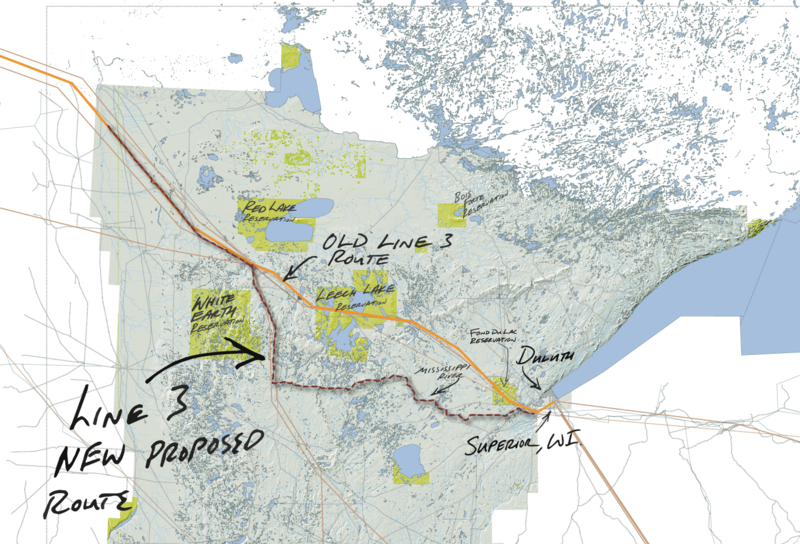 When Will Minnesota Decide On Line 3? The Minnesota Public Utilities Commission is expected to decide in late June whether to grant Enbridge a certificate of need for Line 3. Oral arguments in the case begin Monday, June 18, and a decision is expected by the following week. Related: Oil pipeline's fans, foes gear up for testimony over the fate of Enbridge's Line 3. The commission could decide to let Enbridge build along its preferred route, recommend it replace its current pipeline along the existing route or deny the project altogether. The Line 3 debate illustrates the tug of war between society's dependence on oil, and the threat that oil poses to the future of our world. Climate change activists argue that, if we don't build new pipeline capacity, the oil will stay in the ground, reducing carbon emissions. In northern Minnesota, along the route the pipeline would run, the debate pits environmental concerns against potential jobs and economic benefits tied to Line 3. Pipeline opponents say Line 3 could become the next Standing Rock, where thousands of people camped and protested at the end of 2016 to fight the Dakota Access pipeline in North Dakota. What's The Argument For Replacing Line 3? Line 3 supporters point out that society's demand for oil is still huge, and that pipelines are safer for transporting crude than trains or trucks. Originally, Line 3 could carry 760,000 barrels of oil a day. But as the line has aged, it can only handle about half that amount. A new Line 3 would boost capacity back to its original level. Related: Pipeline plan tests state's environmental-business balance. In northern Minnesota, pipeline supporters say it's an economic issue, too. Much of the region has been starved for work in recent years. But while thousands of people would help build the pipeline, including many from Minnesota, a new Line 3 would only create about 20 new, permanent jobs. What Are The Environmental And Climate Concerns About The Pipeline? Oil spills are a big concern. Opponents note that the nation's biggest inland oil spill happened on the current Line 3 near Grand Rapids, Minnesota. The line has leaked crude other times, too. Enbridge's preferred route runs through sensitive natural areas in northern Minnesota — including the Mississippi River headwaters, wild rice waters, forests and wetlands. Running Line 3 through those areas, opponents say, is too great a risk. Environment: Spill fears rise even as Line 3 backers vow new pipeline will be safe. Climate: Why no one agrees on Line 3's climate change impact. Plus, there is the bigger-picture issue of climate change. Line 3 would carry some tar sands crude, which is among the dirtiest and most carbon-intensive forms of oil. Some opponents say that it's time to stop building pipelines and move society away from fossil fuels more quickly. And Why Are Many Native American Tribes Against The Line 3 Replacement? Many Native American tribes have significantly increased their opposition to oil pipelines in recent years, and Line 3 is a major target. While Enbridge wants to build its new Line 3 off reservation land, it would still cross treaty land, including wild rice waters. Tribes don't want a potential pipeline spill harming their land or water.